David Risley Gallery is proud to announce a solo exhibition of new paintings by Michael Simpson. The Leper Squint paintings continue a thematic thread — the infamy of religious history — that has consumed the artist for 30 years, from the Nights of the Hosannas shown at Arnolfini Gallery in 1983 through the 1989–2009 Bench Paintings series. The Leper Squint is an architectural feature of medieval churches in which an opening in the outer wall, often at an oblique angle, allowed lepers and other undesirables to observe the service while entirely avoiding contact with the congregation. The Leper Squint substantiates the absurd anomaly of Christian belief that leprosy was a punishment from God. These slits are a form of hypocrisy literally built into the foundations of the religion: those who need the church's charity the most are the ones kept outside. Simpson paints his subject square and frontally, providing a piece of furniture as an aid to reach the squint. 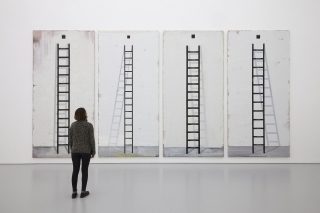 The furniture, a step-stool or ladder, say, invites the viewer into the space of the painting. 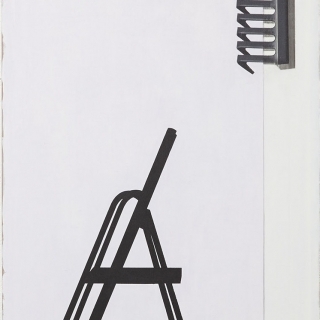 While Simpson’s Bench Paintings faced outwards, with the benches' backs towards the viewer, these new works are internalised: the squint looks into the space of the painting, a space we will never see. The viewer is held in an antechamber, denied view, waiting. The historical and architectural device of the squint has allowed Simpson to make a philosophical series of paintings about looking, about what exists and where we exist in relation to it. What is through the squint? The afterlife, death, the void, paradise, truth? The tone of the paintings is somber and atmospheric. They put us in a timeless space with no sense of location. Simpson provides us with a Beckettian space from which to consider questions of morality, art and mortality.